today is going to be awesome. 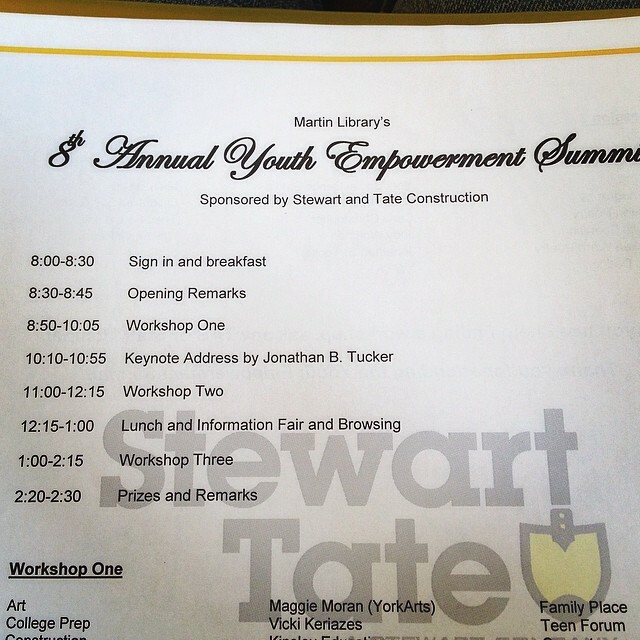 I get to meet a hundred or so high school students from various schools around York, PA at Martin Library’s 8th Annual Youth Empowerment Summit. i’ll be delivering the keynote address, running a couple workshops, and of course performing some poems. hopefully these kids are ready to rock out. the Teen Advisory Board here is on point. they set me up with not only one, but two personal assistants/ guides for the day. they’ve already hooked me up with free muffins, waters, and a badass t-shirt with the TAB cat on the back. it’s okay to be jealous.